I posted earlier about the use of “system mtu” on Nexus 1000v. The internetworking of virtual switch in a physical topology can still be confusing, and the existence of likely display bugs probably didn’t help with the situation. So here is my understanding of why and how, hopefully in more simple terms than any documentation I have seen. First, why enable jumbo MTU on Nexus 1000v? Jumbo support is desirable for applications such as storage, for example your ESX host in a NAS environment. Enabling jumbo on Nexus 1000v is part of the “end-to-end” jumbo configuration, starting from the host. In a typical topology, you will need to configure Nexus 7000, Nexus 5000, and Nexus 1000v since it is the virtual switch that partly resides on the host. You can refer to more configuration details here. A diagram is helpful to illustrate the relationship between Nexus 5000 and Nexus 1000v, particularly the confusing port channel relationship. Note on 5000 VPCs are typically configured (Po101-103). On Nexus 1000v, only system uplink profile is predefined. Port channel are created only when hosts/VEMs are added. 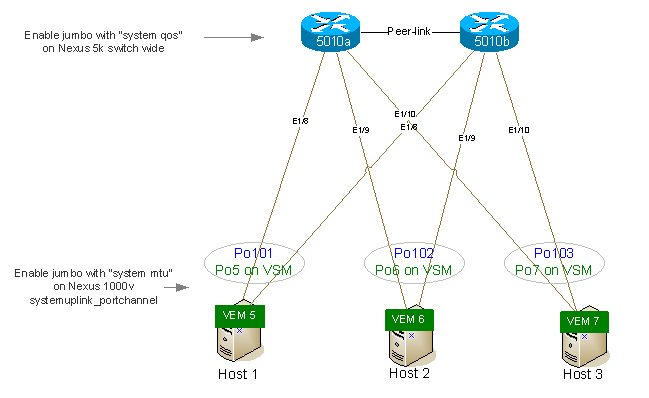 Adding host on vCenter triggers the creation of matching port channels (Po5-7) in VSM. Next, how to enable jumbo MTU on Nexus 1000v? Lastly, how to verify that jumbo is working? This is the most confusing part. Depending on your port type (LCAP etc), you may get different display results. In my experience, both “show int port-channel” and “show interface Ethernet” displays MTU 1500 (which is incorrect). This display error is similar to one on Nexus 5000 (CSCsl21529). But on Nexus 1000v there is no jumbo packet count, thus making verification even more difficult. To alternative to verify that jumbo is really working on Nexus 1000v, is simply to check upstream switch. For example, on Nexus 5000, check either the corresponding port channel or physical interface. Since Nexus 5000 is receiving (RX) jumbo packets from the host, it is a clear indication of the function of Nexus 1000v uplink profile.